I’m so excited for today’s post. This recipe incorporates two things that I love, pumpkin and the slow cooker. Now that it’s getting cooler, that slow cooker has been getting a ton of use in my house and I couldn’t be happier. The house smells great while it’s cooking, I only have one dish to clean, and it does all the work for me. Can I get an AMEN?! Molasses is really great as well especially for pregnant women. It’s full of hidden nutritional gems like magnesium, manganese, potassium and vitamin B6. Maganese is a crucial mineral for your normal bone development, which is important for your growing baby. B6 and potassium are involved with water retention so getting enough of it may help shrink your swollen feet and ankles. Woohoo! Place ingredients in a slow cooker and cook on low for 5-6 hours. Allow to cook for awhile, pour into a mason jar and keep in the fridge overnight. A few ways to use pumpkin butter; serve it on toast, add to your latte, make pumpkin oatmeal, add to your yogurt, use it as a dip for your apple slices. 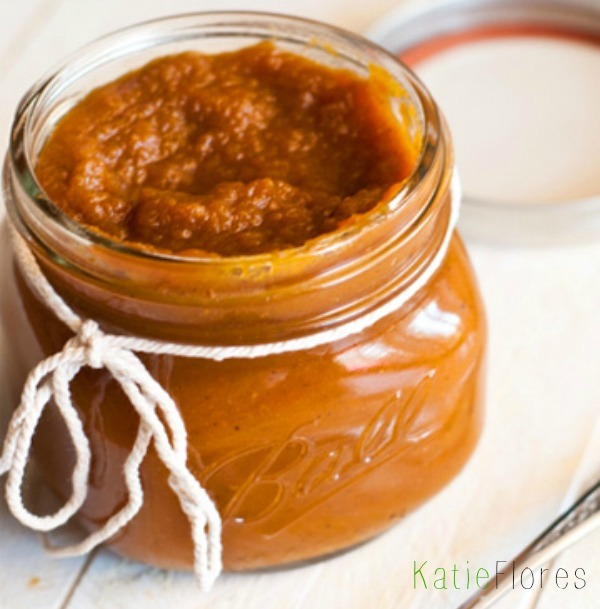 What do you slather your pumpkin butter on. Share in the comments below.